Alone in the Milky Way there are an estimated 100 million neutron stars, but we have discovered few because these densest objects in the universe (black holes are denser, but currently it is impossible to know how much) are mostly old and cold and free of any radiation. Usually they are only discovered if they are either pulsars – a special type of neutron star – or have another star as a companion, and finding individual neutron stars is a rarity. E 0102.2-7219 (E0102 for short) in the Small Magellanic Cloud, about 200,000 light-years from Earth. In the image provided by NASA, the X-ray emissions detected by Chandra are shown in blue and violet while the visible light is detected from VLT is bright red. The bits in dark red and green are based on an additional date from the Hubble Space Telescope. The supernova remnant appears as a large annular structure in X-rays, probably blown by the blast's blast. The green threads indicate oxygen-rich debris from inside the exploding star ejected at the time of the supernova, moving through space at a speed of millions of miles per hour. The smaller red ring in it, which is revealed by the VLT data, expands more slowly than the surrounding pressure wave. In the middle of the smaller ring is a blue dot, the lonely neutron star. The X-ray energy values ​​from this central blue point are similar to the X-ray signatures of two known single neutron stars within the Milky Way – Cassiopeia A (Cas A) and Puppis A – where the supernova remnants are also oxygen rich. In total, about 10 such objects have been found in our galaxy so far. Scientists are still not sure how the neutron star was with the supernova shell outside the center. They have at least two different theories, but none are without their own hard-to-answer questions. Astronomers hope that further observations in X-ray, optical and radio emissions would help to better understand this strange object. 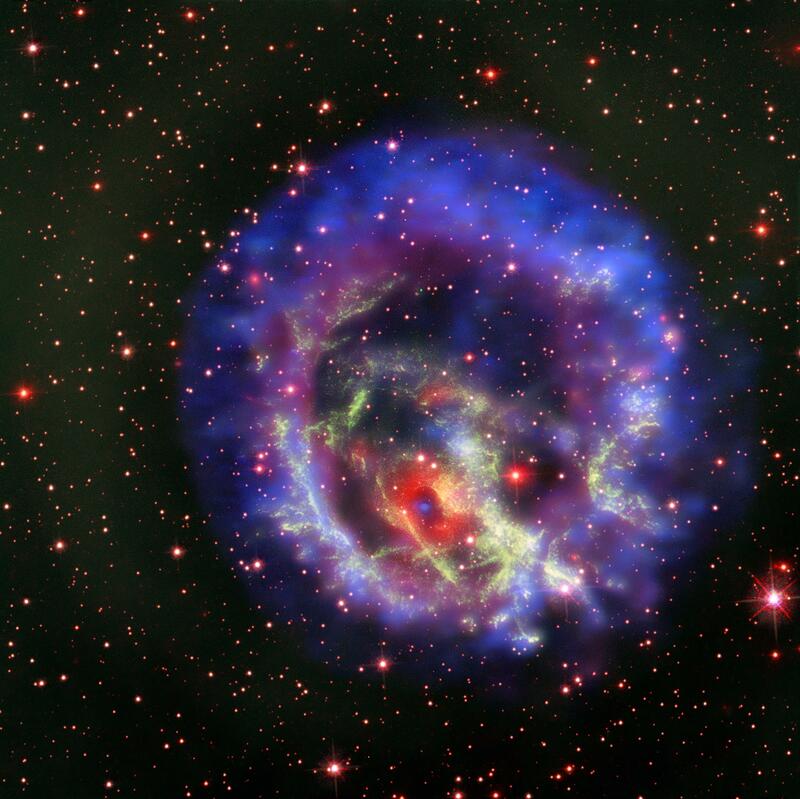 Neutron stars form after the collapse of massive stars with about 10 to 30 solar masses. After a massive star has become supernova and the mass is not high enough to make a black hole out of its remnant core, it creates a neutron star. These objects do not generate their own heat and slowly cool off over time, which is why they are no longer detectable in old age. The only way for them to evolve is through collisions or accretion. The results of the current observations were published in the journal Nature Astronomy and the Pper is available online on the pre-print server arXiv.